The earliest fossils of ostrich-like birds are Paleocene taxa from Europe. Palaeotis and Remiornis from the Middle Eocene and unspecified ratite remains are known from the Eocene and Oligocene of Europe and Africa. These may have been early relatives of the ostriches, but their status is questionable, and they may in fact represent multiple lineages of flightless paleognaths. The African Eremopezus, when not considered a basal secretarybird or shoebill, is sometimes considered an ostrich relative or an "aepyornithid-like" taxon. Apart from these enigmatic birds, the fossil record of the ostriches continues with several species of the modern genus Struthio, which are known from the Early Miocene onwards. Several of these fossil forms are ichnotaxa (that is, classified according to the organism's footprints or other trace rather than its body) and their association with those described from distinctive bones is contentious and in need of revision pending more good material. While the relationship of the African fossil species is comparatively straightforward, a large number of Asian species of ostriches have been described from fragmentary remains, and their interrelationships and how they relate to the African ostriches are confusing. In China, ostriches are known to have become extinct only around or even after the end of the last ice age; images of ostriches have been found there on prehistoric pottery and petroglyphs. Ostriches have co-existed with another lineage of flightless didactyl birds, the eogruids. Though Olson 1985 classified these birds as stem-ostriches, they are otherwise universally considered to be related to cranes, any similarities being the result of convergent evolution. Competition from ostriches has been suggested to have caused the extinction of the eogruids, though this has never been tested and both groups do co-exist in some sites. Today ostriches are only found natively in the wild in Africa, where they occur in a range of open arid and semi-arid habitats such as savannas and the Sahel, both north and south of the equatorial forest zone. The Somali ostrich occurs in the Horn of Africa, having evolved isolated from the common ostrich by the geographic barrier of the East African Rift. 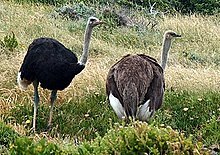 In some areas, the common ostrich's Masai subspecies occurs alongside the Somali ostrich, but they are kept from interbreeding by behavioral and ecological differences. The Arabian ostriches in Asia Minor and Arabia were hunted to extinction by the middle of the 20th century, and in Israel attempts to introduce North African ostriches to fill their ecological role have failed. Escaped common ostriches in Australia have established feral populations. ^ Brands, Sheila (14 Aug 2008). "Taxon: Genus Struthio". Project: The Taxonomicon. Retrieved 12 Jun 2012. ^ Mikko's Phylogeny Archive  Haaramo, Mikko (2007). "Paleognathia - paleognathous modern birds". Retrieved 30 December 2015. ^ Paleofile.com (net, info) . "Taxonomic lists- Aves". Retrieved 30 December 2015. ^ Hackett, S.J. et al. (2008) A Phylogenomic Study of Birds Reveals Their Evolutionary History. Science, 320, 1763. ^ Yuri, T. (2013) Parsimony and model-based analyses of indels in avian nuclear genes reveal congruent and incongruent phylogenetic signals. Biology, 2:419–44. ^ Bibi, Faysal; Shabel, Alan B.; Kraatz, Brian P.; Stidham, Thomas A. (2006). "New Fossil Ratite (Aves: Palaeognathae) Eggshell Discoveries from the Late Miocene Baynunah Foramation of the United Arab Emirates, Arabian Peninsula" (PDF). Palaeontologia Electronica. 9 (1): 2A. ISSN 1094-8074. ^ Janz, Lisa; et al. (2009). "Dating North Asian surface assemblages with ostrich eggshell: implications for palaeoecology and extirpation". Journal of Archaeological Science. 36 (9): 1982–1989. doi:10.1016/j.jas.2009.05.012. ^ Andersson, J. G. (1923). "Essays on the cenozoic of northern China". Memoirs of the Geological Survey of China (Peking), Series A. 3: 1–152 (53–77). ^ Kurochkin, E.N. (1976). "A survey of the Paleogene birds of Asia". Smithsonian Contributions to Paleobiology. 27: 75–86. ^ Kurochkin, E.N. (1981). "New representatives and evolution of two archaic gruiform families in Eurasia". Transactions of the Soviet-Mongolian Paleontologial Expedition. 15: 59–85. ^ Zelenkov, Nikita; Boev, Zlatozar; Lazaridis, Georgios (2015). "A large ergilornithine (Aves, Gruiformes) from the Late Miocene of the Balkan Peninsula". Paläontologische Zeitschrift. 90: 145–151. doi:10.1007/s12542-015-0279-z. ^ Donegan, Keenan (2002). "Struthio camelus". Animal Diversity Web. University of Michigan Museum of Zoology. ^ Freitag, Stephanie & Robinson, Terence J. (1993). "Phylogeographic patterns in mitochondrial DNA of the Ostrich (Struthio camelus)" (PDF). The Auk. 110 (3): 614–622. doi:10.2307/4088425. JSTOR 4088425. ^ Rinat, Zafrir (25 December 2007). "The Bitter Fate of Ostriches in the Wild". Haaretz. Tel Aviv. Retrieved 10 January 2017.